After the quick mockups with the new seat belt locations I needed to raise the fuel tank to give the extra clearance. I need to raise it about 25mm, I decided to make a completely separate subframe to mount the tank to, then mount the subframe to the chassis. First job was to cut out the old mount tabs .... out with the trusty angle grinder. Subframe mocked up, and sitting in the chassis. That is all I had time to complete. The plan is to get the subframe mounts completed and get it mounted in the chassis, still considering adding rubber mounts. Once that is complete mount the fuel tanl to the subframe. Just starting to do a quick mockups of all the guards on to decide if I need to change them ... Actually after all the work on the rears Im not as happy with them as I was. 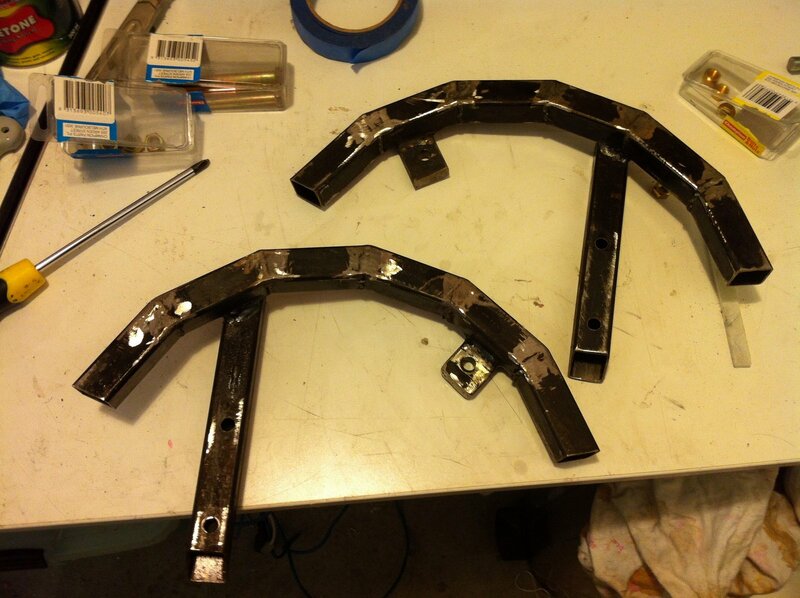 The rear guards, despite my efforts will still need some triangulation to give them extra strength. I think that I will either add the extra mount down to the bottom roll bar mount or add a completely new point... still deciding. Before I could continue with the guards I had to tap out the existing holes with a larger metric diameter. So after tracking down and purchasing a 8mm tap the two existing holes were re-tapped. Once this was done the downward mount could be bolted on to test fit and find were it needed to be welded to the main mount. Down mount bolted on and the tack welded while in place. Mounts taken off and fully welded. I did both at the same time. 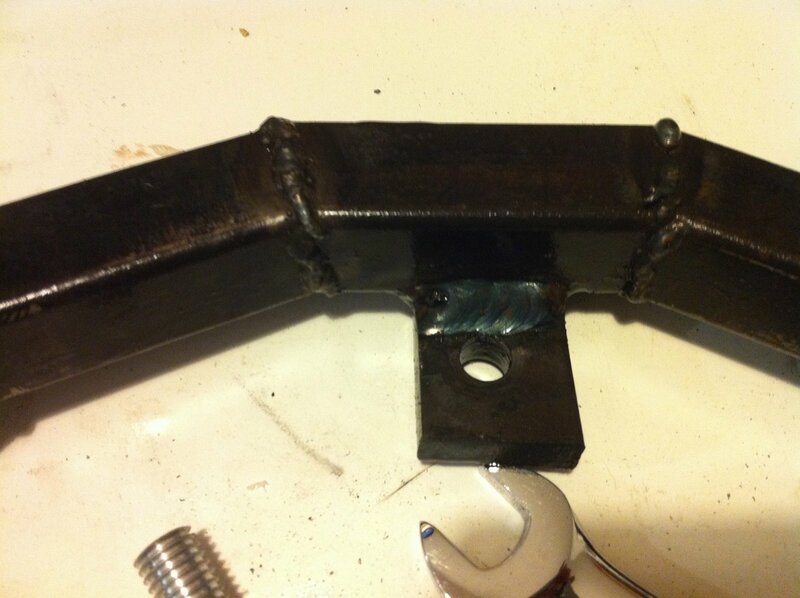 Finished base mount welded up and bolted on. Spacers taped on to the tire to get the guard to sit at the correct ride height so I can start to figure out the rest of the mounting system. So here is the master plan, 12mm rods coming out of the newly created main mount, that the steel strip and fiberglass guard will be mounted to. Below shows the first one. The debate I'm having is do I need more than three. I don't think I do. 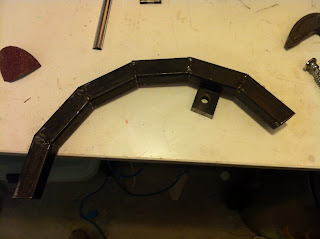 While waiting on the transmission tunnel to cure I started on the very last major fabrication piece, I hope ! the front guards. In New Zealand unless you have a fender exemption your hotrod needs to have guards. I dont have my fender exemption yet, so I need to run with guards. 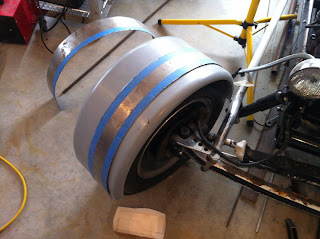 I have completed the rears and now needed to start on the front. I got some fiber glass ones molded from the steel guards thatI have made, the rears are all steel. I wanted the fronts to be as light as possiable due to the vibrations that they would experience and light weight would help with not having to have a huge mounting system. Well that was the theory. The shot below shows what the old guards were like and the new unmounted fiber glass guard. So after sitting and pondering what I wanted to do, I came up with a plan. Of course I had to use what I had in the way of materials, so the trusty 25mm box section was used. I was going able to reuse the mounts that the old guards used. So I just had to come up with the mounting design. Same as the rear I wanted the guards to go on and come off easily, had to be a little differnet to what others had done. 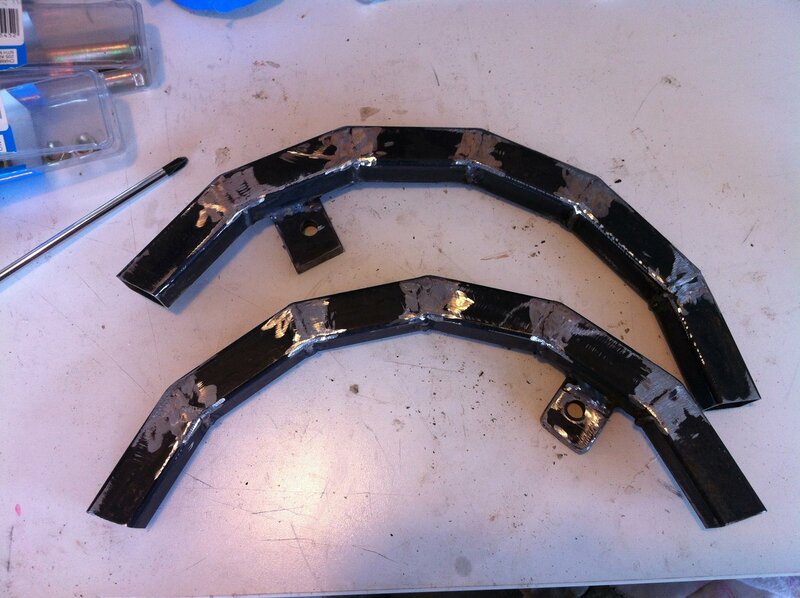 So on with the show, I first cut 12 sections with angled ends, when pieced together they start to form a circle. The circle radius is close to the internal rim radius of the front tires. Here's one welded up and the first mount also welded on. The mount was cut out of the old guard mounts. I have to reuse what I have. Once happy with how this was heading as a design, I welded up both mounts. 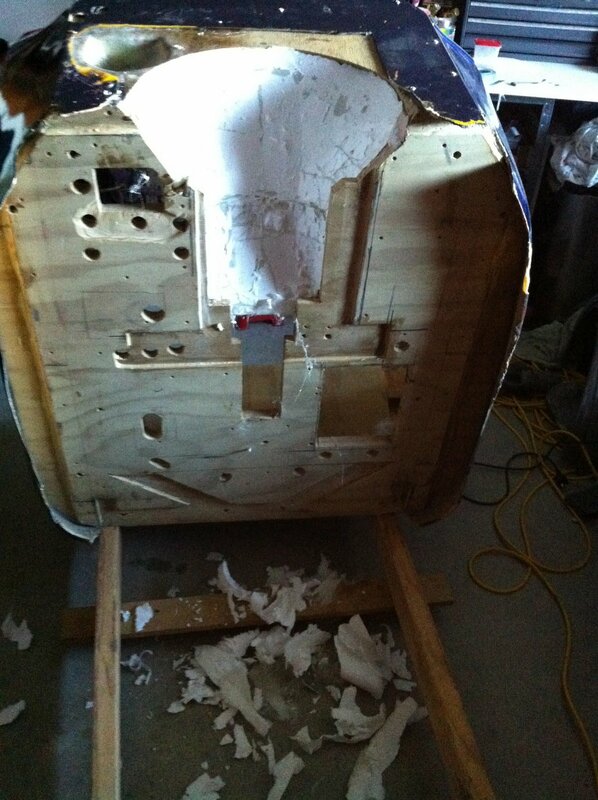 Over the weekend I was able to get out and cut one of the front steel guards up. I wanted the steel strips so that they would match the rear in design elements. It took for ever to cut the strips and went through 6 cutting blades. The cut steel strip over the fiberglass guard. I also took the chance to clean up the mounts. That was it for the weekend.